A practical guide to establishing mindfulness in everyday life. go but don’t know how? Clear and simple guidance on how to meditate, from learning the basic fundamentals through to applying mindfulness in all areas of life. 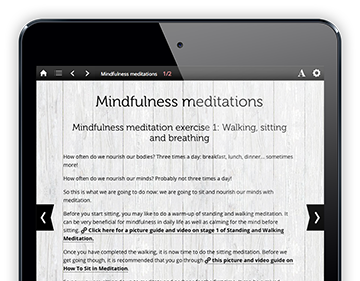 Videos, step-by-step images and embedded audio clips guide you through meditation routines, mindfulness enhancers and tailor-made exercises for the busy modern world. 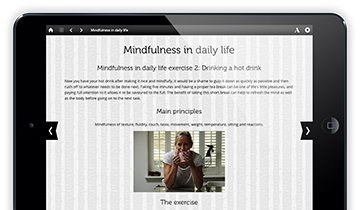 Further resources and downloads help you stay motivated, make the practices your own and integrate mindfulness into your routine. Paul Meek has been practising mindfulness since 1997 after a chance encounter on a train in India with a nun who studied under the Dalai Lama. After this encounter, Paul returned to England and learnt meditation under the head monk of the Buddhapadipa Temple in Wimbledon. Since then he has made meditation a key part of his life, waking early each morning to practise. However, even today he still approaches it with the “beginner’s mind”, treating each sitting as if it was the first. This has allowed his meditation to grow and blossom and given him the wisdom to be able to teach others. Paul spent twelve years teaching mindfulness to children, teenagers and adults at the Buddhapadipa Temple in London. He now runs courses on mindfulness for everyday life in Surrey, England, where he lives. Paul wrote The Silence Between the Noise to share his knowledge of mindfulness with others and to help others be well and happy by making mindfulness a part of their lives. In the first book you will learn the fundamentals of how to meditate, beginning with walking and sitting mindfully. Audio guides, step-by-step images and videos will guide you through the process, even if you’ve never done it before or have struggled to do so in the past. Two exercises for establishing mindfulness in daily life and two wellbeing enhancers supplement the core principles, allowing you to set up practices that can be applied to any situation or moment. Click the "buy" button on our website or within the preview of your selected eBook. If you aren't logged in then you will be taken to a page where you can register a new account with us or log-in if you already have an account. TIP: The quickest way to create an account and log-in is by using your Facebook account to authenticate you. Click on Log-in with Facebook to create an account or log-in. To buy your eBook simply accept the terms and conditions and click "Secure check-out". You can also enter a voucher code if you have one. After clicking "secure check-out" our secure payment gateway will load in a pop-up window. You can either pay with a PayPal account or with a credit/debit card if you prefer by selecting "Pay as guest". TIP: If you opt to "Pay as guest" please make sure you select the correct country before entering your details! Once your payment has been confirmed, you will be given a link to your online library where you can view your eBook or download it. You will also be sent an email with links to your library and the eBook you have purchased. TIP: For easy access in future, you can bookmark your eBook or add it to your homescreen (on iPads). You can buy eBooks directly from us, or in certain cases eBooks can be purchased from retailers such as Apple and Amazon. If you prefer to buy from another retailer, click on the "other" button to view links for the available retailers for the eBook you wish to buy. These links will redirect you to the relevant product page for the retailer of your choice. - Get access to all available formats, allowing you to enjoy your eBooks on a wide range of devices. - Benefit from special offer bundles, discounts and purchase gift vouchers. - You don't need to register another account with us and can use you account with another retailer, if you have one, for a quick and easy check-out. You can also buy direct from our website, which will give you access to all available formats (including those for retailers listed above) and allow you to benefit from special offer bundles, discounts and more. Click here for more information on buying options. More info on devices and formats? We support a wide range of devices and formats, giving you the freedom to choose. However, there are differences between them. Click here for more information. Description View your eBooks online on a wide range of devices using a web browser. Download and view your eBooks using the iBooks app on an Apple Mac or iPad. Download and view your eBooks on Amazon devices or apps. Layout This option offers the most visually appealing layout, formatting and graphics. This option is similar to that of the online reader but has a few simplifications to accommodate Apple's eBook page layout. This option offers the most basic layout to accommodate the wider range of devices and apps on offer. Features All interactive features and enhanced content are available. Enhanced content is available offline. However, a number of interactive features are not available in this format or require an internet connection. All enhanced content is available online only via streaming. No interactive functionality is supported in this format. However, a few interactive features are available online. Connectivity You need to have an internet connection to use this option. All content, including multimedia, is available offline. But certain interactive features require an internet connection. All text and images are available offline, but all enhanced content and interactive features require internet connection. System requirements This format is optimised for use on computers (desktops and laptops) and tablets (e.g. the iPad). Computer - you need a recent browser e.g. Chrome (recommended), Internet Explorer, Firefox or Safari. Tablets - this format is optimised for iPad but is also suitable for a number of Android tablets e.g. Samsung Galaxy and Google Nexus. Apple Mac or iPad with iBooks app. Amazon devices - while text and images can be viewed on any Amazon device (including eInk readers), a multimedia-capable device is required for enhancements and interactive features. Other devices - eBooks in this format can be viewed on computers and other tablets (e.g. iPad, Google Nexus) using Amazon Kindle apps. Please note: if you buy eBooks directly from us then you automatically get access to all available formats. However if you purchase from another retailer then you will only be able to access the format from their apps and supported devices. Vouchers are either general (can be applied to any of our eBooks) or specific (can only be used for specific eBooks). If you have a specific voucher, or are not sure what type of voucher you have, enter your voucher code into one of the "Redeem" boxes on our website. If the voucher is a specific voucher then you will be taken automatically to the check-out page for the applicable eBook with the voucher applied (once you've logged in or registered). If your voucher is not for a specific product, the above step will take you to a catalogue page where you can choose to purchase a publication. You will then be able to enter the voucher code on the check-out page for your desired publication. Click "apply" and the voucher will be applied. Please click here for more information on redeeming vouchers and frequently asked questions.